As mentioned yesterday, I have heard from multiple Sobos that the damage to the Gila River area has been extensive due to hell (Summer fire) and high water (Fall flooding). 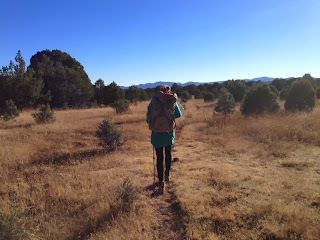 We decided for the sake of our sanity, sanctity of our shoes, and the relatively rip-free condition of our clothes, we would take an alternate around the Gila as described by Jim Wolf. 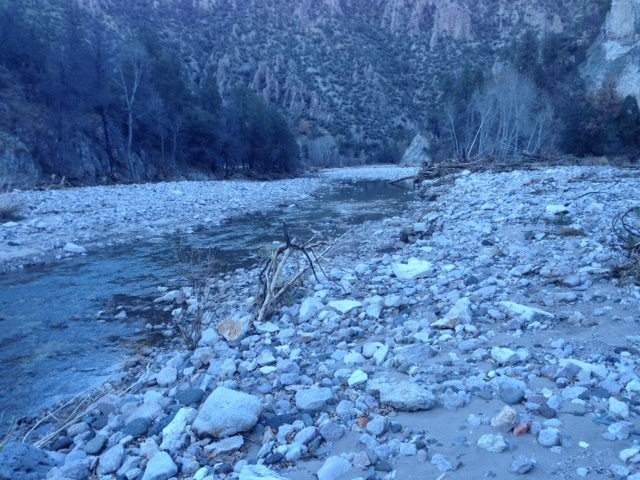 After much consultation with the GPS, we found the alternate, which required a roadwalk East, then taking the Meadows trail South to cross the Middle Fork of the Gila River. The road was relatively easy walking, dry and clear. The Meadows trail is primarily a pack trail. It was well-marked and recently maintained, though a bit torn up by horses passing while the trail was still muddy. As a result, the trail is mostly hard baked cups of dirt, like walking on the stippled surface of an egg carton. It was easiest to walk with a little flop in my step, allowing my ankles, knees to adjust to the uneven surface. 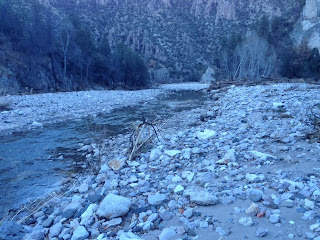 The trail walks dead South from the road to descend ~1,000' into the bottom of the Middle Fork of the Gila River canyon. The descent was steep, rocky and slippery. I relied heavily on my poles to keep from skittering off the edge of the switchbacks. When I got to the bottom, I had my first view of the post-flood destruction. It was awesome, and I mean this as in 'awe-inspiring', and not as in TMNT slang. 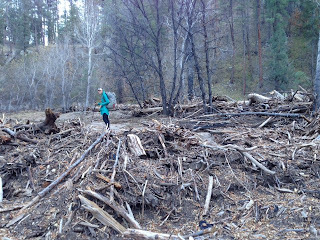 Huge trees were uprooted and splayed across the broad washes of dry silt. 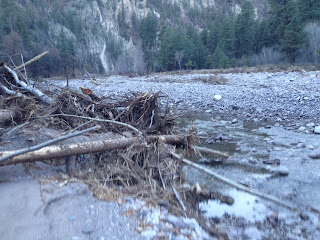 The riverbed had extended to nearly the entire canyon floor, wiping out previously grassy sections, like The Meadows. Since the sun was sinking low, we hurried to find the trail back up the other side of the canyon, for our ~900' ascent. The actual trail had been washed out, but we found a steep set of switchbacks, angled at > 70 degrees. Like climbing a ladder without handrails. It was slippery business in the eroding hillside, literally climbing up a step up, then sliding down a half step in the sand. Think naturally occurring Stairmaster. We finally climbed high enough to find the intact section of trail to the canyon rim. The switchbacks were nicely graded, and we made it up to the top just as the sun was setting. All in all, a satisfying, albeit long day. Looking forward to a half day (~11.5mi) in to Doc Campbell's tomorrow morning.